Since the early XIX th Century, when they were first built in Britain, pleasure piers – built for leisure and entertainment purposes only – have become a staple of resort towns. 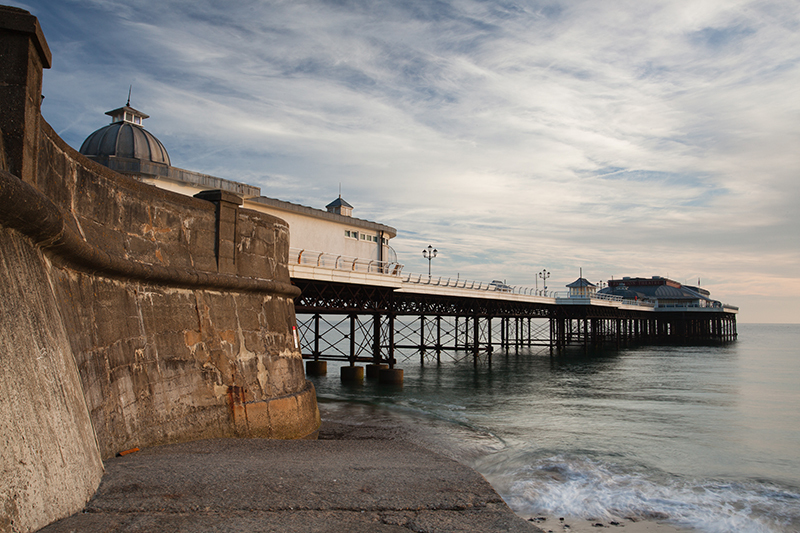 Since they offer a great variety of outdoor and indoor activities, piers are a great way to spend a relaxing day by the sea. 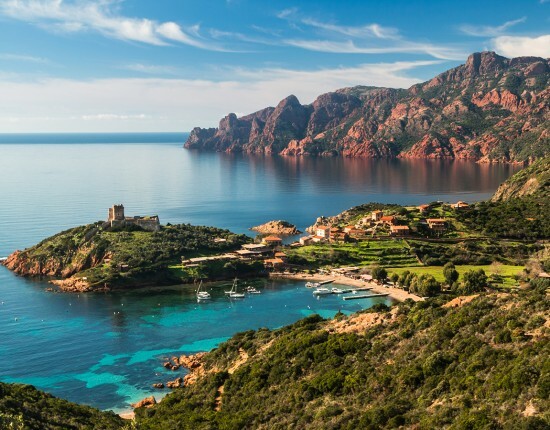 Here are the most beautiful piers in Europe. This iconic landmark is an essential part of the English seaside experience. 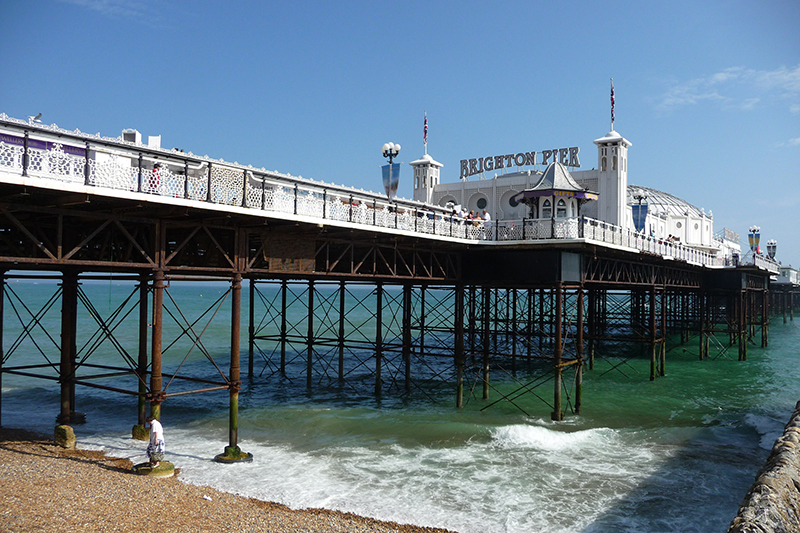 Originally named The Brighton Marine Palace and Pier, this is one of the piers built in Brighton and the only one still standing. Maintaining its 525 m long structure is no easy task, painting alone takes 3 months to complete, but the efforts pay off, with Brighton Pier becoming one of the most popular tourist destinations in the UK. Apart from the rides and attractions, the pier offers a variety of restaurants of which the most famous is Palm Court Restaurant also called “The Spiritual Home of Fish and Chips”. Named after the former queen, Victoria’s Bar offers an amazing view of the seafront and some delicious scones to go with the afternoon tea. After all, you are in England. Located very close to the pier is Brighton Marina, one of the largest in Europe and a perfect location for those who want to visit by boat. The Victorian seaside town of Clevedon is located along the Severn Estuary, between England and Wales. 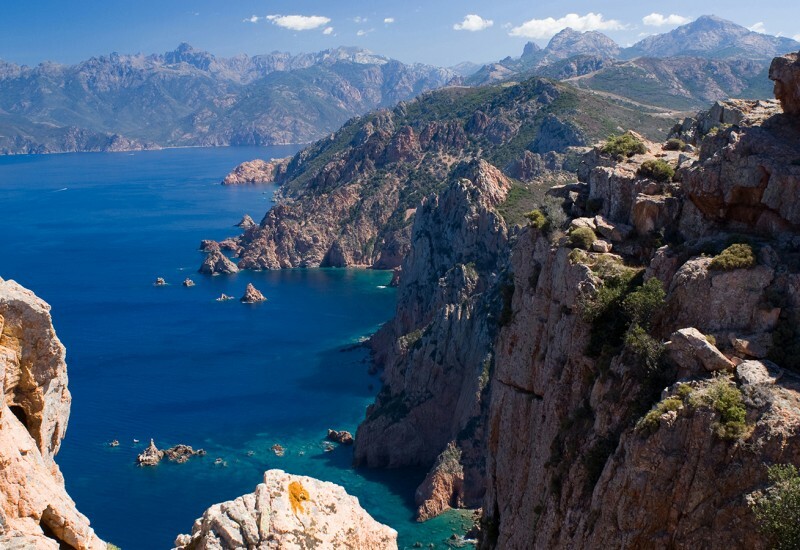 The seafront here is mostly rocky and – due to its high concentration of minerals – represents a site of special scientific interest. The 312 m long Clevedon pier, with its panoramic deck and pavilion, looks like a structure from ancient times, which is no wonder given its opening date: 1869. It was originally intended to be a ferry port for passengers travelling to South Wales but in 1970 a part of the structure collapsed into the sea during the maintenance tests. While this could have been the end of this historic landmark, local people formed a Preservation Trust and started gathering the funds needed to restore the structure. Their efforts were successful and Clevedon Pier was reopened to the public in 1989 and it was restored to its full Victorian glory in 1998 with the completion of the pavilion. Today it’s once again a crown jewel among Clevedon’s landmarks which include the medieval St. Andrew’s Church and Clevedon Court manor. The pier relies almost entirely on donations for its maintenance. 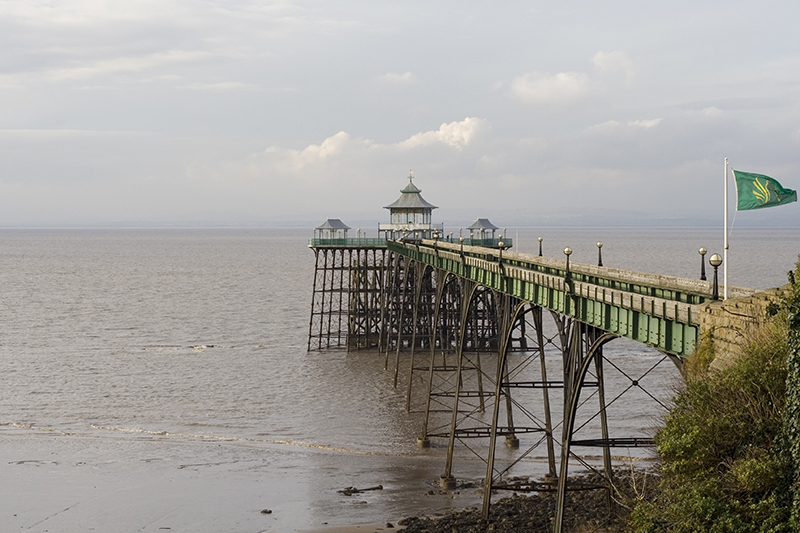 Anyone can be a part of Clevedon Pier’s history by sponsoring a plank (in return a plaque will be placed on the pier recognizing the support). You can have a wonderful time at the Bristol Marina, a fully serviced development located on the Bristol Channel. 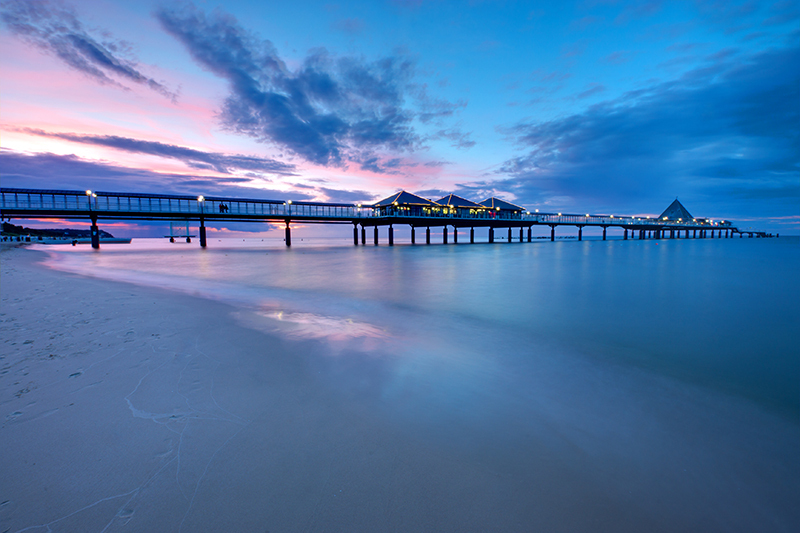 The German island of Rügen is renowned for its numerous beaches and lagoons but also for its resort architecture, with numerous villas and mansions that give it an upper-class appearance. The island’s natural beauty is best exemplified by the World Heritage Site of Jasmund National Park, with its primeval beech forest and chalk cliffs. Sellin Pier is one of the few on the whole island and it has the advantage of being the longest (394 m) and, some would say, the most beautiful. From the impressive Wilhelmstraße Avenue, with its numerous examples of resort architecture, tourists reach the pier by walking down 99 steps that take them to a wide sandy beach. The Bridgehouse, a T-shaped 2-story building where you’ll find several restaurants and shops, is a perfect place to relax and enjoy the view. Further on there is an observation deck and a diving gondola. The first pier was built in this location in 1906 and rebuilt after a fire in 1925. Severe weather conditions destroyed the second pier in 1941 leaving only the pier house standing and the site fell into disrepair until it finally had to be demolished in 1978. The German reunification prompted the reconstruction efforts and the third pier was opened in 1998. Today this is one of the most photographed attractions on the island of Rügen, due to its popularity as a wedding venue. The annual Season Opening Ball, a sophisticated event traditionally held here in March, entices many visitors. Sailing around Rügen is a delight and we recommend leaving your boat at the Harbor of Thiessow, on the South-Eastern side of the island. Close to Rügen lies the smaller island of Usedom that is 80% administered by Germany and the remaining 20% by Poland. Located North of Stettin Lagoon, a place that offers many recreational activities, Usedom is also called Sunny Island because it has the largest number of sunshine hours in both Germany and Poland. The seaside resort of Heringsdorf has been a popular tourist destination for over a century, ever since the German Emperor Wilhelm II began spending his summers here. For this reason, the town is also known as Kaiserbad – “Imperial Spa”. With an average width of 40 meters, the 12 km long sandy beach is part of a continuous 40 km stretch that is the longest in Europe. The current pier in Heringsdorf was opened in 1995 to replace the wooden structure built at the end of the XIXth Century. 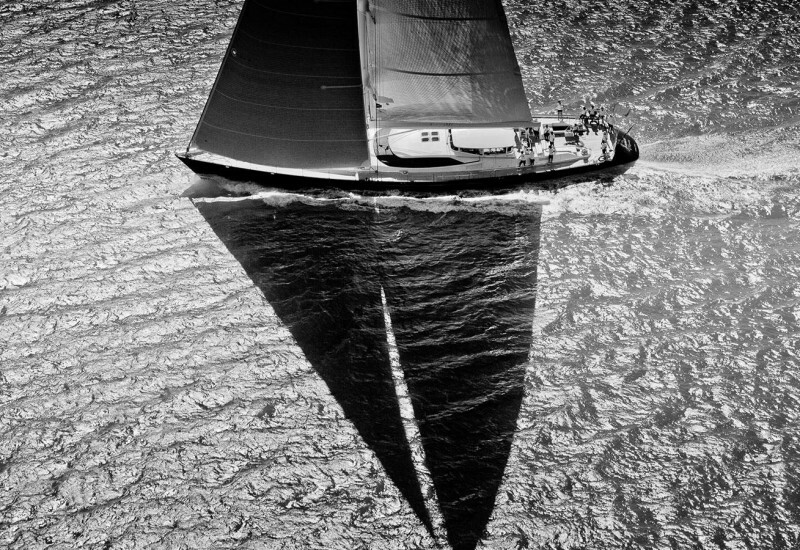 Its most distinctive feature is the pyramid shaped pavilion that offers stunning views of the sea. You can enjoy a meal in a relaxing atmosphere and pick up a few souvenirs from the shops along the pier. Our recommendation for a good marina is Ueckermunde, in Koserow municipality. Like many similar constructions in England, the picturesque Cromer Pier was built in the Victorian era, when piers were quite fashionable. 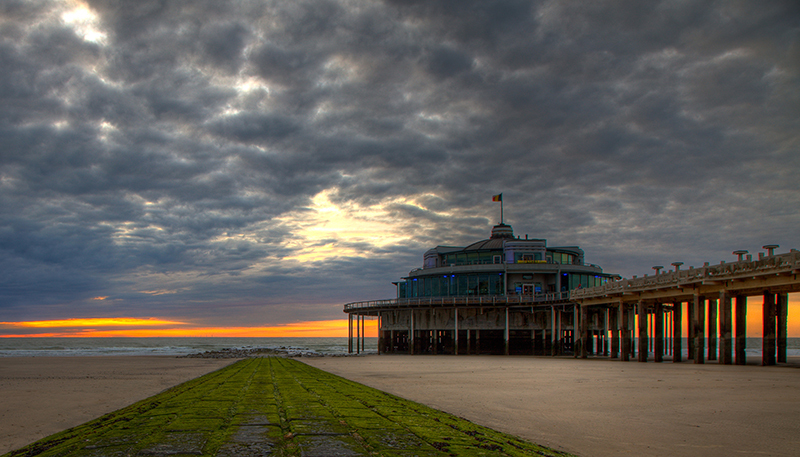 Many hotels sprung along the seafront, providing truly spectacular views of the North Sea. 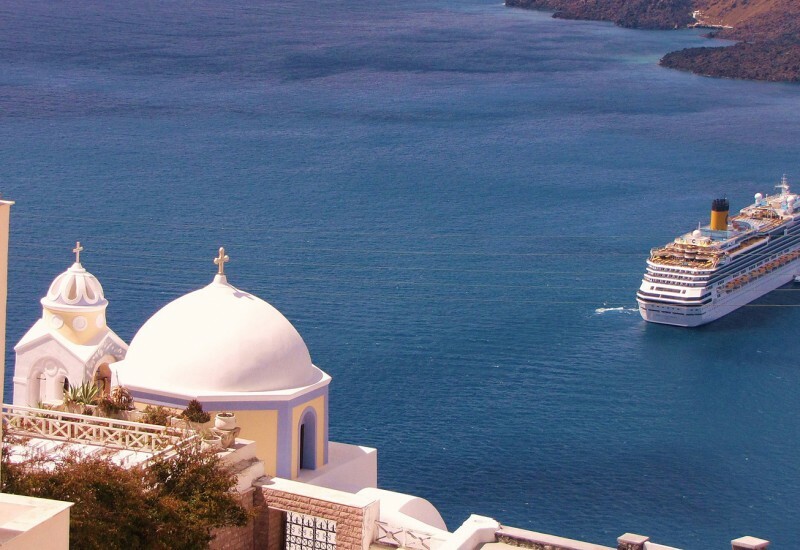 Tourism has been steadily developing during the XXth Century and today this is an important part of the local economy, along with crab fishing. Measuring 151 meters, Cromer Pier has a relatively short structure compared to others on this list, but its claim to fame comes from its unique show held at the 500-seats Pavilion Theater at the end of the pier. This live variety show also known as the Seaside Special is the only one of its kind in the world (i.e. held on a pier) and makes for an unforgettable experience. 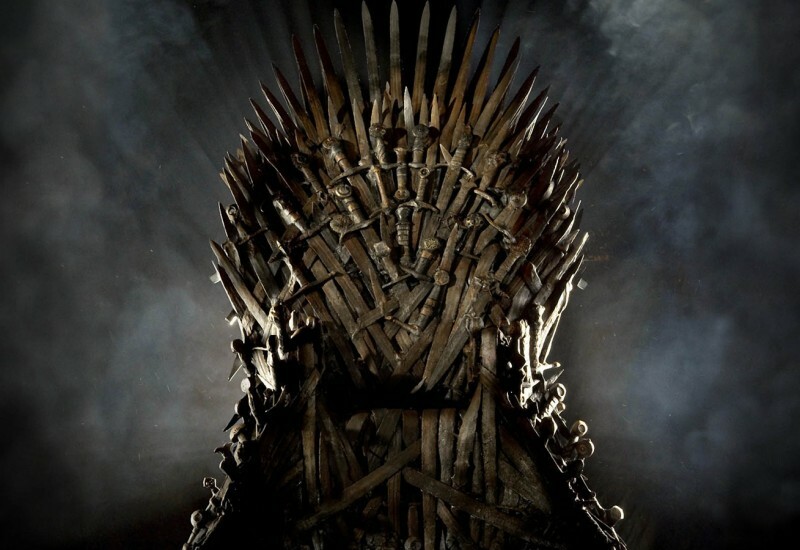 Shows run twice a day from June to September. Crabbing is a quintessential English seaside experience and the pier’s gift shop has all you need to spend an afternoon catching crabs. We recommend Royal Norfolk & Suffolk Yacht Club, in the city of Lowestoft. 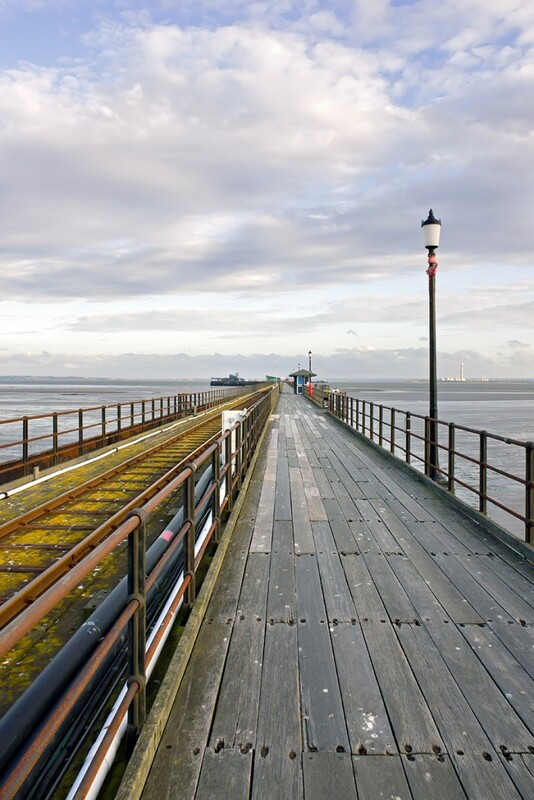 The longest pier in the world, Southend stretches for 2.1 km into the Thames Estuary. Since it’s so long, it has a railway to transport passengers from the shore to the head of the pier. Visitors can enjoy superb views from the Royal Pavilion, an award winning construction. Throughout the year the pavilion is the host of a number of jazz and comedy festivals, concerts and plays. Those who choose walking along the pier can take a break and enjoy their time at one of the cafes and restaurants along the way. Famous chef Jamie Oliver refurbished a cafe in 2013, reopening it as an ice cream shop. If you’re seeking for more thrilling ways to spend your time, Adventure Island amusement park is located just at the entrance. Enjoy a lovely stay at the Halcon Marina, in the southern part of Essex County. This 350 m long pier is the only one of its kind in Belgium. 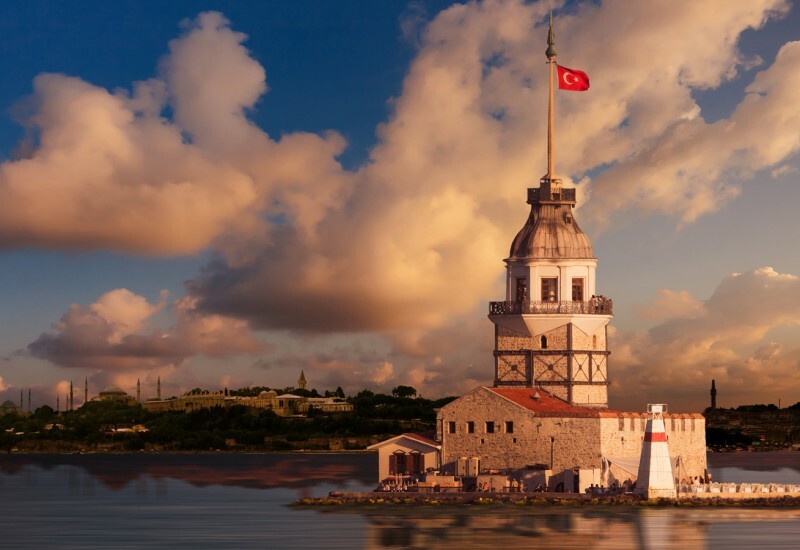 At the end of it lies “The Cake”, a circular building that includes a 360-degree panoramic terrace, a café, a restaurant, 2 bars and an exhibition of the power of storms. Numerous events are held here during the summer months the most impressive being the lights and fireworks show. 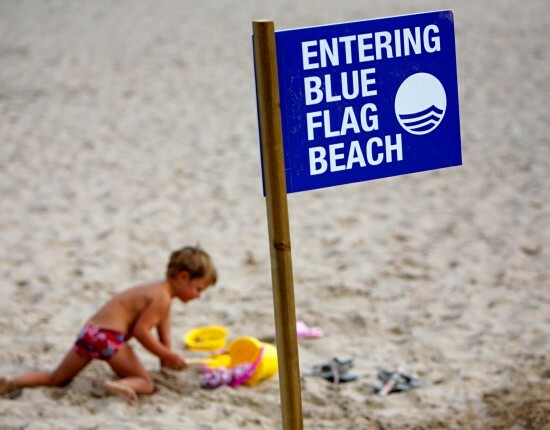 The wide sandy beach is usually busy during peak season but not overly crowded. If you visit it at the end of August you can catch the Flower Parade, with massive themed floats made of flowers. Visit the Belgian North Sea coast and moor your boat at Royal Scarphout Yachtclub Blankenberge Marina. 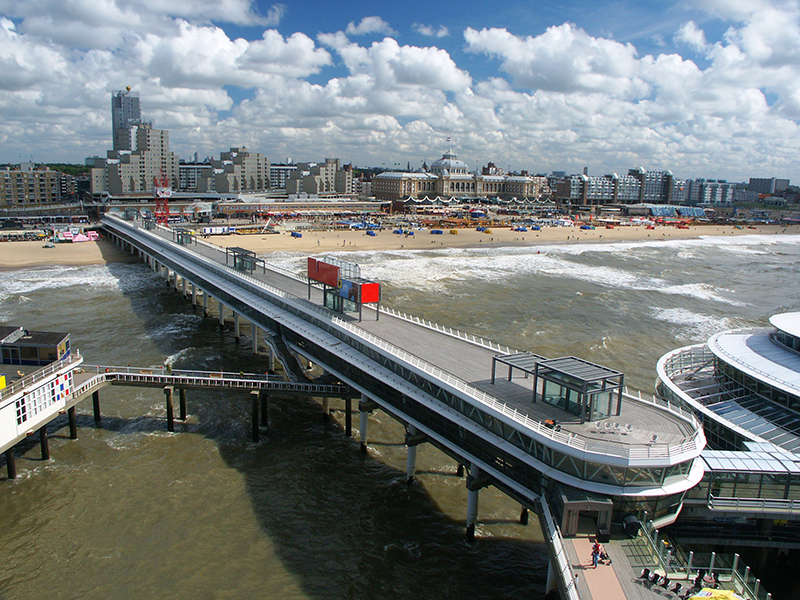 The unusual Scheveningen Pier in the Dutch resort town with the same name (near The Hague) ends in four distinct platforms that give the entire construction the appearance of a flower. On one of these platforms there is a 60 m high bungee jumping tower. The pier itself is 382 m long and was built on two levels: the lower deck and the upper part. The adjacent sandy beach is popular among locals and tourists for water sports. Other attractions include the Madurodam miniature park, the sculptures at Belder aan Zee museum and the annual sand sculpture competition. Have a wonderful time at WV Nieuwe Waterweg Marina, located in the municipality of Schiedam. 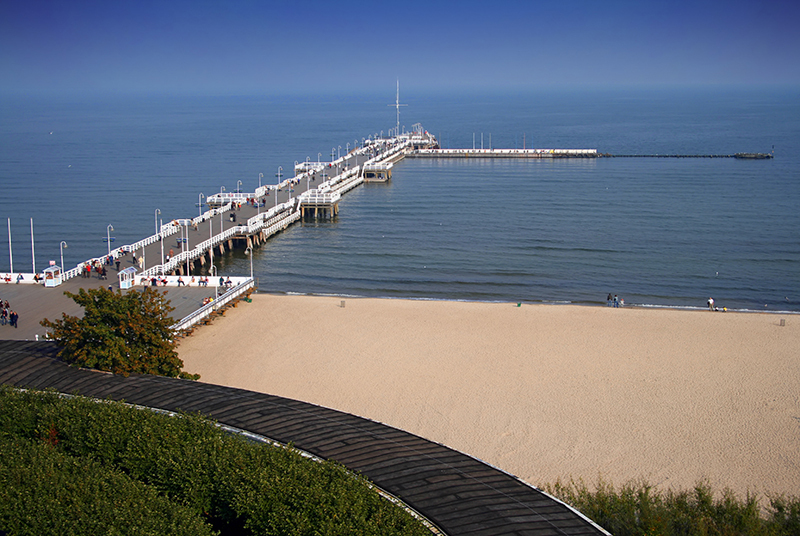 The Polish seaside resort of Sopot is home to the longest wooden pier in Europe, stretching on 511 m into the Baltic Sea. 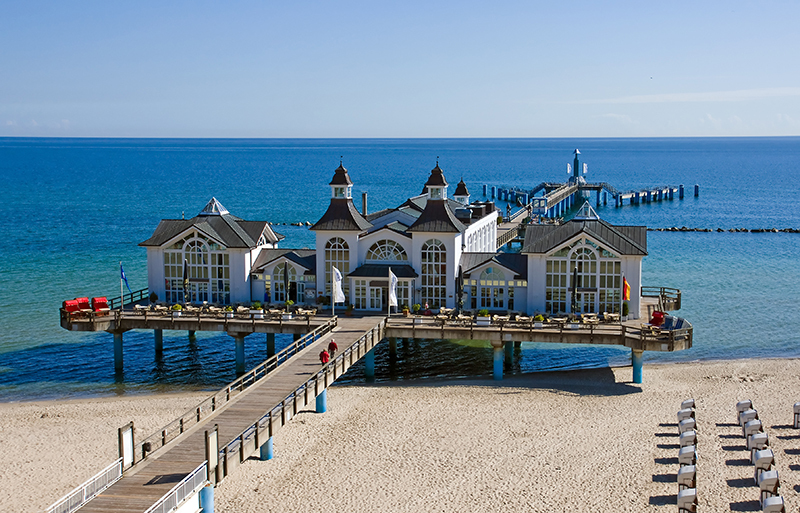 Unlike many piers, the one in Sopot has no restaurants, rides or gift shop. The pier is purely for walking and enjoying the amazing views of Spa Square, where many festivals and concerts take place. 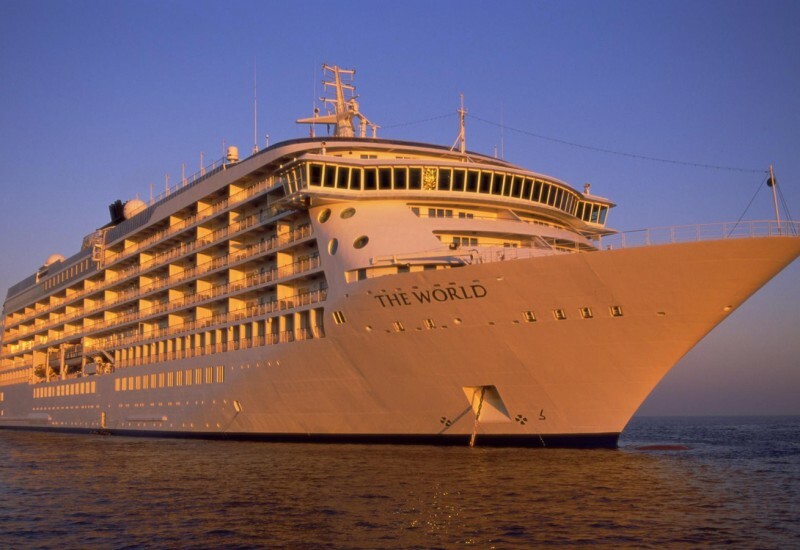 A ship offering cruises around Gdansk Bay moors at Sopot pier during the summer months. The pier charges an admission fee of 50 euro cents that goes towards maintaining its structure. If you’re planning a visit to Sopot, you can feel great at Gdynia Marina.